I love painting in watercolour, using a direct fresh approach. I aim for a loose, impressionistic style and I enjoy painting many different subjects. Over the past 16 years I have studied with a number of leading artists and with the Open College of the Arts. 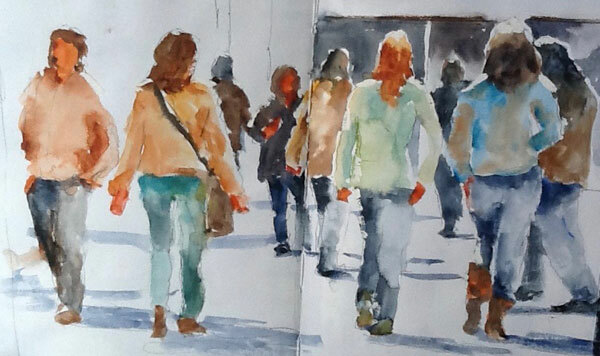 I have used a wide range of media - however my favourite medium is watercolour. I was elected a member of the Sussex Watercolour Society in 2007 and I am also a member of the Association of Sussex Artists and the Attic Club, in Ditchling. I have exhibited widely throughout the South East, including a solo show in the Trinity Gallery, Tunbridge Wells. My paintings have been exhibited at the Royal Institute of Painters in Watercolour, Mall Galleries, London and at Patching Art Centre, Notts.